Leading Manufacturer and Exporter of Earthing System such as Earthing Pipe in Pipe Electrode, House Earthing System, Gel Earthing Electrode, Copper Earthing Electrode, Earthing Set, Earthing Electrodes and many more items from Chennai. 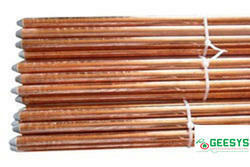 In Copper Bonded Rod Copper Coating should comes in the range of 100,180 250 Microns respectively. 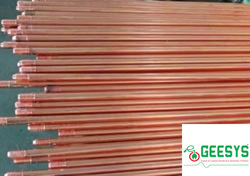 In Copper Bonded Grounding Rod Clad, Copper purity is 99.95%. 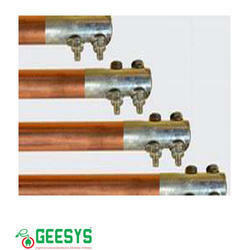 The Copper Bonded Grounding Rod is fuly covered with copper cladding without any cracks,holes, cavities etc. Magnetic conducting rate is low. Thus reducing the lightning induction. Good tensile strength in Copper Bonded Grounding Rod, over 600N/mm2. In BIS Book of IS 3043-1987 Code of Practice, Page No. 21 si. no. 9.2.3. It is stated that strip Electrodes are better compared to Pipe and even Plate Earthing, which are also goods in high resistivity soil conditions. As per IS 30431987 Requirements we are using SIP i.e. Strip in Pipe Technology. The primary earthing electrode (Flat) is inserted the secondary electrode in the form of hot dipped galvanized Flat which would yield a very high cross sectional conduction area and surface area. The secondary electrode (Outer Pipe) is filled with a Highly conductive and non Corrosive Compound, an innovative product of our which safeguards the primary Electrode. Over a long period. Even if the outer shell corrodes the inner electrode functions in a normal way protected by the special compound. The bottom is sealed with the help of hot dipped galvanized solid base and the top with a sealed cap theentire unit is sealed so that the corrosion does not seepth rough. As it is a Highly conductive, area of conductive zone will be the pitsize[6 inches or 8 inches and 2.5 to 3.5 Mtrs. Depth. It will be the conductive zone. Whereas in conventional type of earthing conductive zone limits up to that pipe or plate. As it is Hydroscopic, in nature that means it absorbs the moisture form surrounding Five Times more of its dry Volume. Due to this you don't need to put any charcoal powder, salt water etc., and there's no more periodic maintenance It is maintenance free system. The MFC has Unique Composition that slows down the normal wear and tear of the outer Shell due to corrosion and helps to sustain functional utility for a long period that is above 20 Years and that to without any periodic maintenance. High Load carrying and maximum fault current dissipation instantly. Single Product in wide range in different sizes to suit every and all kinds of Earthing requirements. Providing an easy and instant discharge for Fault Current/Lightning strikes. Controlling electromagnetic interference and Radio Frequency Emissions. Maintaining a stable reference potential for Instrument accuracy. 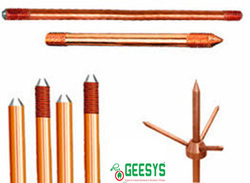 GEESYS Copper bonded ground rods are the ideal driven earth rod as they offer the installer an economical and efficient earth rod grounding system. Pure electrolyte copper is uniformly molecularly bonded into a high tensile steel core to a minimum thickness of 250 microns (0. 254 mm), thus ensuring excellent corrosion resistance and eliminating electrolytic action. Coupling threads are formed by a rolling process to ensure thread strength and to maintain the integrity of the molecularly bonded copper. A good earth should have low electrical resistance to earth, good Corrosion resistance, and ability to carry high currents repeatedly, a reliable life of at least 30 years. It is available in 12 mm , 14mm , 17 mm dia with standard length of 1.2mtr, 1,5mtr, 1.8mtr 3mtr . GEESYS name, length, diameter and part number is roll-stamped within 12" (304,8 mm) of chamfered en. For rods to be listed to UL® 467, they must be at least 8' (2.43 m) in length.IEC® EN 62561-2 supercedes EN 50164-2.Additional lengths available. Chemical Earthing Rods and ElectrodesChemical earthing is engrossed copious superior trustworthy as compare to conventional earthing, you may paragon deviating recompenses using chemical earthing technology. Ultimate of the earthing electrode patrons are now distressing away from prehistoricac customed conservative set up and desire maintenance free chemical earthing electrodes universal. Subsequent assessment discloses the much reparations of chemical earthing electrodes over conventional earthing grounding solution. Conservation Free: No need to dispense water at unvarying interlude excepting in grimy filthy soil. 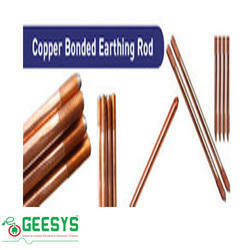 GEESYS is counted among the most renowned manufacturer, trader and supplier committed to offer a wide variety of Copper Bonded UL Earthing Rod that has good electrical conductivity and corrosion resistance. The offered earthling rod is provided in diverse specifications as per the demand of customers. This earthling rod is manufactured utilizing top quality of material and innovative technology at our advanced production unit. This earthling rod is tested on several parameters of quality to ensure flawless dispatch. 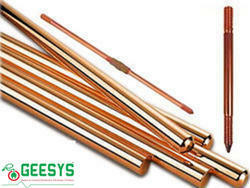 Copper Bonded rod with strip provides more area of contact to connect more number of connecting strips, by which a good contact can be ensured to dissipate the high fault current quickly into the ground. Listed in category of topnotch companies, we are offering Chemical Earthing Electrode of excellent range and quality to our clients. Easily installed at any given location within short time period; Chemical Earthing Electrode has excellent chemical properties and best charge carrying capacity. It could be installed quite easily and gives trouble free performance for years. Client satisfaction is our main motive. TEST PROCEDURES: A length of the rod shall be rigidly held in a clamp or vice. Applied a force normal to the free end of the rods at a distance from the clamping device equal to 40 times the rod diameter. The application of the force shall be such that the rod is permanently bent through 0 30-degree angle. RESULT: There was no cracking of the coating when subjected to the test described above. These different samples were subjected to the above test. TEST PROCEDURES: The thickness of the protective coating shall be determined by a reliable magnetic coat tester, with the tester hold vertically on the specimen. RESULT: The copper coating thickness was measured as 0.25mm or 250 microns at all the points of the rod. Three different samples were subjected to the above tests. In addition to the above tests, CPRI, Bangalore have conducted short time withstand current tests on two different sizes of copper bonded rods. No cracking or breaking or melting of the rod was noticed after the test. The copper cladding was intact. TEST PROCEDURE: A 467mm (18”) length of rod with one end cut to a 45 degree shall be driven between two steel clamping plates or the jaws of a vice set 1.02mm (0.04 inch) less than the diameter of the rod, so as to shear off sufficient metal to expose the bond between the coating and rod. RESULT: There was no separation of the coating from the steel core when subjected to the test described above. Three different samples were subjected to the above test. 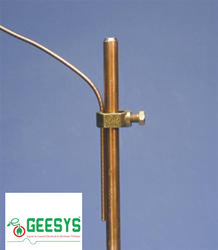 One of the prestigious products exclusively manufactured by GEESYS Earthings, in which the 99.9% pure electrolytic copper is molecularly bonded with steel rod which is nickel sealed is again coated with tin to give an extra layer of coating of 12 microns (as per IEC 62439) over the 100/250 microns’ copper bonding, which ensures total protection from galvanic corrosion. The same is ideal for sea shore areas and in areas with low soil resistivity.